Partly thanks to fierce competition between companies and partly thanks to Japan’s love of seasonal, regional or otherwise unusual food there are probably more weirdly flavoured Japanese snacks than it’s possible to eat in a lifetime. Of course most of these are just fun unusual flavours, cheesecake flavoured KitKats, watermelon flavoured Pepsi or even savoury sour plum flavoured pretzels. The kind of thing that brightens your day while you’re doing the shopping. Some however, some just make you stare. You take a moment, look at the snack again, but nope someone really did decide to make Sapporo Beer Flavoured Caramel. Join us on a trip down the Top 5: Strange Japanese Snack Flavours, climbing the heights of Japan’s oddest, weirdest… and even most delicious confectionery and treats. Okay, so we’re going to start off with a sort of opposite. 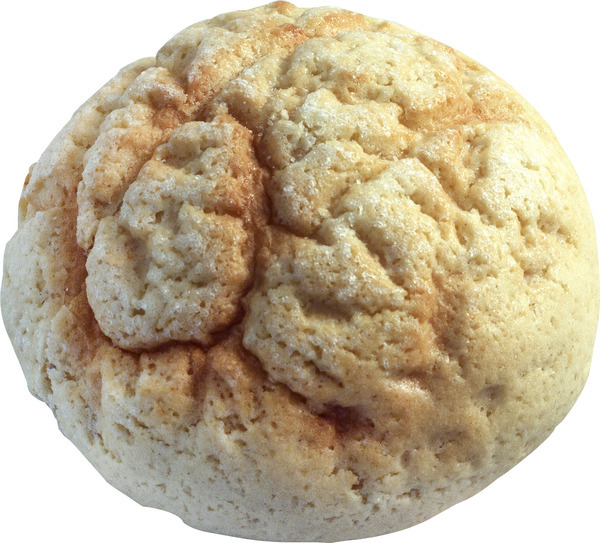 Melon pan isn’t really strange for what it tastes of, but more what it doesn’t…. namely melon. Yes, that’s right not only does melon pan not contain any melons, it also doesn’t actually taste of melon either. It tastes delicious, just not of melon. So what’s up? Well, it’s actually the resemblance of the crispy, sticky cookie coating on melon pan to a rock melon or cantaloupe that gives it the famous name. Having said that, melon fans’ disappointment at the lack of melon flavour means you can now find melon flavoured melon pan as well these days. We’re not sure if this is called melon melon pan or just melon pan though. It is frankly, a melon too far for us. There are a lot of novelty ramune flavours. As well as the standard and oddly compelling kinda-lemon sort-of-lime flavour, there are also popular regional variations like mango, melon or yuzu. A few years ago there was a TV show where the losers had to drink oddly flavoured ramune as a punishment. It is to this latter category that curry ramune sadly belongs, proving once and for all that combining a delicious thing and a delicious thing can still make a kind of ‘ugh’ thing. Really, all that’s left is for them to make it massive. For those of you that enjoy crossing the streams (we don’t recommend this) you can even enjoy a ramune flavoured KitKat while you drink your chocolate flavoured ramune. As you may have gathered Japanese KitKats are a bit different from their continental cousins. 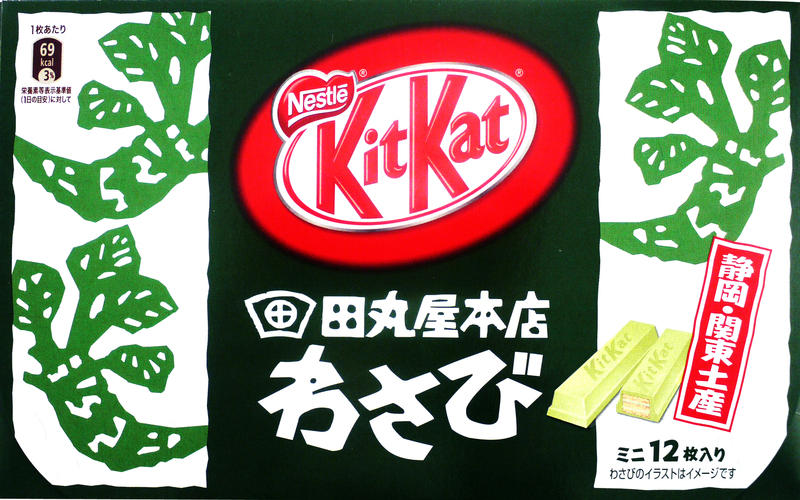 The majority of novelty KitKats are exclusive to special locations, focusing on regional dishes or produce. This is fine if you are Kyoto and get the Matcha KitKat as your culinary envoy to the world. If you are Shizuoka on the other hand, you get Wasabi KitKats. Luckily for the international reputation of Shizuoka, it actually works quite well. The wasabi and the white chocolate work together to give a kind of sweet, but fiery taste (think chilli chocolate). On the plus side, if Nestlé continue to release more savoury Kitkats you could probably recreate some kind of meal using KitKats alone. How about KitKat curry rice or KitKat ramen? Ahh, natto. 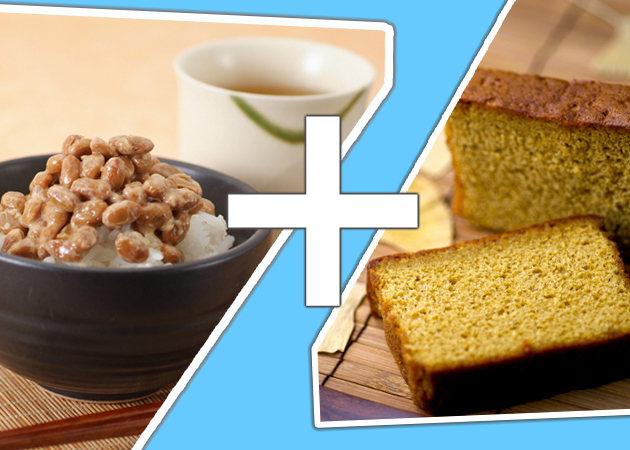 Natto got a honourable mention in our previous Top 5: Weirdest Japanese Food! blog and for good reason. Made from fermented soy beans, this extremely healthy (but pongy) food is famous for inspiring a love-hate relationship in all that try it. Usually enjoyed on rice or in other savoury dishes like sushi, recently it’s been making in-roads into the last great bastion of un-healthy food… cake! While it maybe good news for health fans (it is a good alternative protein after all), if you, like me, recoil in horror at anything even slightly natto-esque it will be sad news. Who knows what delicious treats will be harbouring the devil bean! Not just content with interfering with cakes, it’s also been making appearances in jellies, hard candy and with jam on toast. Okay, we’re approaching our next and final item. If you don’t have a strong stomach, we strongly, strongly suggest you don’t read the last item. Still here? OK, scroll down. Like many people across the world, Japanese people are very concerned with ways to make themselves look younger or prettier or both. Over the years this has included a lot of food, for example nori seaweed has been believed to help hair grow shiny and strong since the Heian period (700s -1100s)! With this in mind, enter one of Japan’s strangest trends, placenta drinks! While placenta drinks are not supposed to actually taste of placenta, we’re not sure they’d be our go to drink if we wanted fruit flavoured refreshment. They’re made from all kinds of animals depending on the brand, including pigs and dolphins (but probably not humans). If necking a bottle of placenta drink is not your speed, brave souls can even have placenta injected into them at beauty salons! If you want to try something similar, but like your edible cosmetics a bit more fruity and a bit less terrifying why not give umeshu plum wine with collagen or royal jelly a try? Phew, that’s all over! Ready for more!? If you feel like expanding your taste buds in slightly less extreme ways, there are plenty of unusual but delicious snacks to be found at Japan Centre. We recommend the wasabi peas, sushi candy set or curry pretzels as slightly more sedate starts to your snacking odyssey! 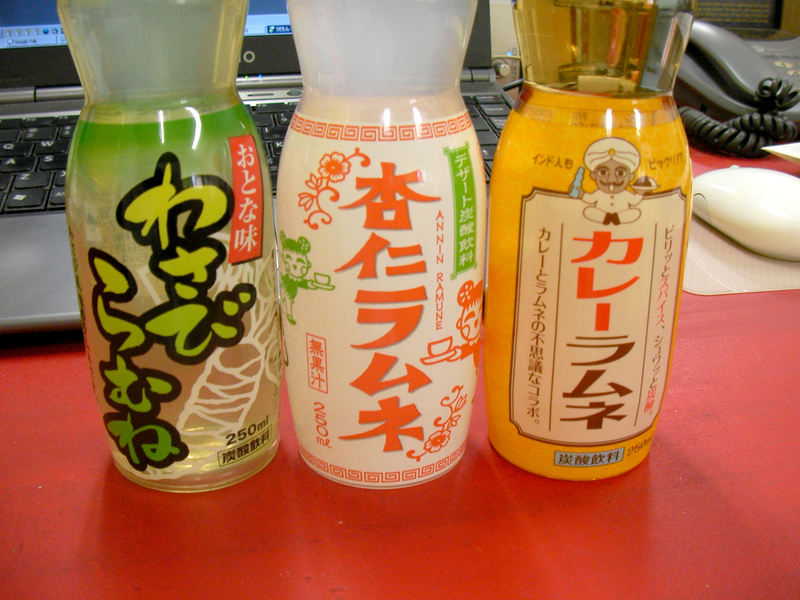 Thanks to ryumu at Flickr for the curry ramune image. Thanks to Ray Larabie at Flickr for the placenta jelly drink image. Thanks to Yoshizi at Flickr for the kastera cake image. Posted in Food and tagged KitKat, Ramune, Top 5, Weird. Bookmark the permalink. Hi! Not sure about the placent jelly drink but I’d try the wassabi Kit Kat! The weirdest (and least pleasant) thing I ever tasted was Ghengis Khan lamb flavoured caramel. I think I will hunt down some wasabi kitkat as that sounds amazing! oh I love natto, but placenta drinks is taking it too far!